Why not? Skiing down is no sillier than climbing up it. In fact it brings a nice symmetry to Everest’s mad dream. One could say it sort of justifies the deadly and unnecessary climb up. In 1970, long before conquering Everest was a routine leisure event, Japanese champion ski racer Yuichiro Miura decided he needed to climb up so he could ski down. He became obsessed with the idea. It took years of preparations, a huge team of scientists, and 600 overloaded Nepali and Sherpa porters to haul all the gear, food, and cameras needed to make this crazy wish come true. It wasn’t an expedition, it was an invasion. 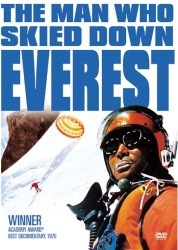 Higher into the snow Miura’s obsession to ski down Everest cost the lives of 6 men on his team. This film is hypnotic and meditative. What starts out as a gonzo prank turns into an introspective zen journey, in part because of the cost of his achievement. This moody film is the complete opposite of any ski movie made since. There’s no exultation, no hurrah, no high-five grandstanding. Instead Yuichiro Miura grapples with his own will, fear, and ambition. He begins to wonder whether any achievement is worth the sacrifices, even when freely given. He escapes the circle of questioning by skiing down. This film might be better titled Zen and the Art of Daring. It’s powerful, spooky.